Be brave be uniquely you: Shipping Worldwide. Free in Singapore. Please do take note that Orders placed on Public Holidays in Singapore will be shipped on the next business day as all delivery parties such as Post Offices will not be in Operation. Currently, we are working with SingPost for all local and international deliveries. Track your registered orders here - https://www.singpost.com/track-items. We will not be liable for any mail that is lost via Normal mail without tracking options. By opting for Normal mail you are accepting a risk of lost mail due to no tracking of services for such situations. Please contact us immediately if your mailing address is not complete or incorrect. Honestly, Brave is not responsible or held liable for parcels with an incorrect or incomplete address. Once the item is out for delivery, we will be unable to make any formal amendments. All customers are personally responsible for any local taxes or charges incurred during the delivery process. Honestly Brave will not be held responsible for any parcels that are confiscated by the customs due to unpaid taxes. · All parcels are traceable via https://www.singpost.com/track-items. · For all US orders, please call USPS to trace your parcels. The status of all parcels will stop updating when they arrive in the US. · Please check with your local post if your order is withheld at your local custom - refer to “CUSTOM TAX” section for more information. · Note that it is beyond our control should there be any delay in shipping. 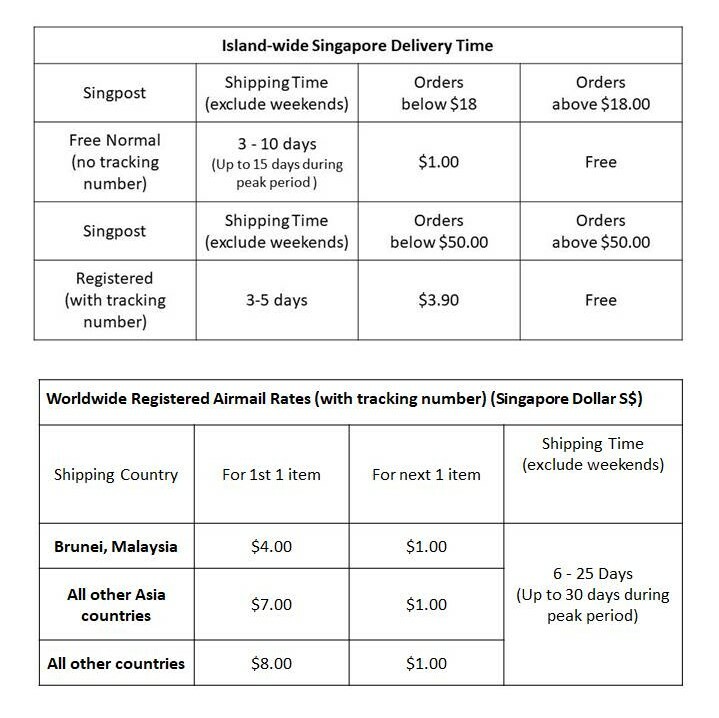 All delivery estimates are provided by SingPost.